Bloody Mary Tomatoes | Good. Food. Stories. As much as I feel bad for the December birthday babies getting their big day overlooked year after year, I always have to throw a self-indulgent pity party for those of us who are chained to the stove straight from November through New Year’s Eve. You would think the Pilgrims, Indians, Dear Lord Baby Jesus, Santa Claus, and the New Year’s Baby would have convened to discuss the complete inconvenience of having the nation’s two biggest food holidays so close to one another, and vote to spread the love a little bit. But they didn’t, and so we’ve become accustomed to shoving sheets of gingerbread cookies into the oven as soon as the Thanksgiving turkey vacates the premises, to cleaning up the hot mulled cider mugs so we can make room for Champagne flutes. It’s enough to make even the most dedicated party host rebel and order up a plate of pre-steamed shrimp cocktail from the local mega-mart. Let’s not go to the shrimp cocktail well, please? Instead, why don’t we all take a breath and try one of the 15 no-cook hors d’oeuvres I’ve created for iVillage. If you can’t even bother to turn on a toaster oven to brown your baguette slices, hey, don’t worry about it. There’s no law saying these hors d’oeuvres aren’t just as good on crackers and fresh bread—in fact, they’ve been designed so you won’t have to heat a thing. None of these appetizers should be confined to making a once-a-year appearance around the holidays, either—they’ll translate from festive cocktail hour to backyard barbecue just fine, and to be frank, this is the way I like to eat when I’m alone. Bits and bobs on crackers, cheesy nibbles, and swipes of spreads alongside a glass of wine; it’s the Lorelai Gilmore diet, only with fewer boxes of takeout. From a new version of the classic cheese-and-nut ball to spicy quick-marinated mushrooms to a crazy artichoke dip-guacamole mash-up, I had a lot of fun working on the recipes. But hands down, my favorite of the bunch are the Bloody Mary tomatoes. It’s sort of an edible shot glass for my favorite brunch drink, dousing crunchy celery in vodka, horseradish, and Worcestershire sauce before stuffing the soaked-up bits into fresh grape tomatoes. They’re so good I have to share them with you now. If you’re serving these at a family party, just leave the vodka out of the recipe. The same spicy, zesty flavors will still stick, but they’ll be safely booze-free for your younger guests. Whet your whistle with the following recipe, and please take a peek at the other 14 no-cook recipes at iVillage! Dice the celery stalks and mix with the vodka, horseradish, hot sauce, and Worcestershire sauce until well combined. Let sit at room temperature for an hour or in the refrigerator overnight to allow the flavors to marry. Slice the tomatoes in half lengthwise and scoop the seeds out of each half with your finger. Pour the celery into a mesh strainer to drain the excess liquid. 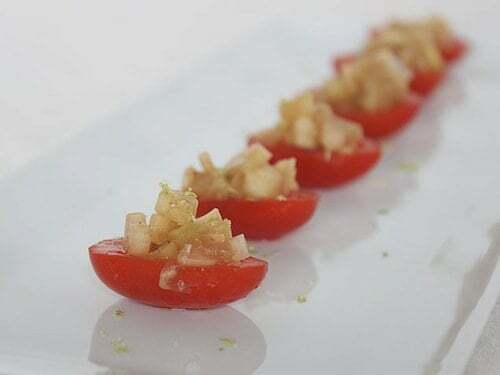 Fill the hollowed-out tomatoes with small scoopfuls of the marinated celery. Zest the lime and sprinkle the zested peel over the tomatoes before serving.